Live photo booth with 5 second videos for each photo. Is there a better alternative to SnapItUp? Is SnapItUp really the best app in Image Editing category? Will SnapItUp work good on macOS 10.13.4? SnapItUp makes you turn that frown upside down! A 5 second video is saved for each photo so you can always find that perfect smile. 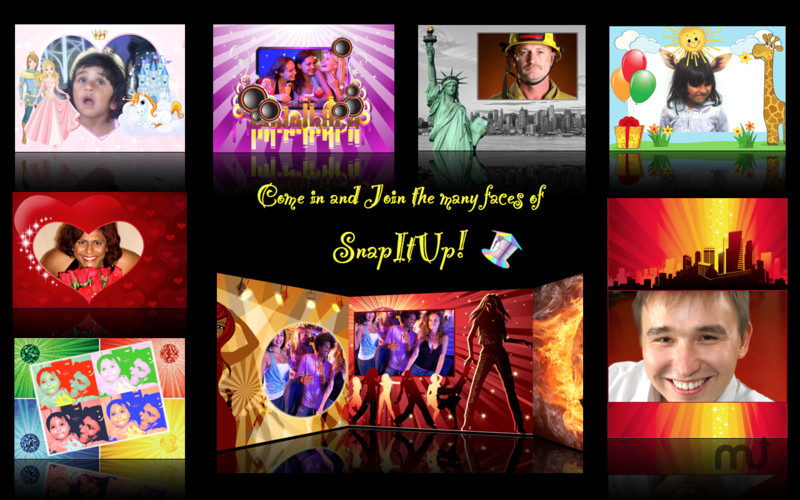 Live, 3D, fun - SnapItUp is a photo booth with a large selection of themes for adults and kids alike. Want more themes? VIsit our website or you can always create and share your own with our built in editor. No image editing tools needed! The same editor can be used to theme your own existing photos and videos or adjust ones taken earlier. SnapItUp is easy enough for toddlers to use and we have personally seen one year olds taking their own photos. Older kids will enjoy instant print functionality, while adults can adjust, re-theme and e-mail photos on the spot. Feeling lazy? External webcams and Apple Remote are fully supported, so sit back on the sofa and snap party photos from your big screen TV.